Every week on the message boards of Expat Women in Korea I’ll see a post about the plight of being Blonde in Korea. Maintaining luscious, golden locks isn’t so tough if you have the right tools (or the right stylist – Kimchi Days and Soju Nights recommends JP Hair). To all the blonde and/ or DIY (Do-It-Yourself) women in Korea, there are two salon supply stores in the Sincheon area (near Jamsil, not Hongdae). 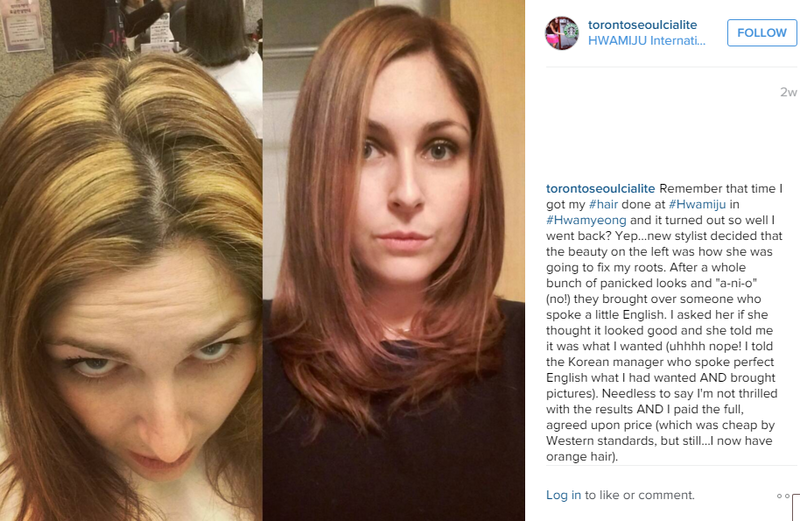 The reason I’m actually blonde in the first place is due to a Korean hair salon f*ck up. The first time I went in I wanted some warm highlights. They did a great job of lightening up my practically black hair. I was so thrilled, I even wrote a blog post about the experience. Fast forward a few months to about this time last year. I was heading up to Seoul from Busan to see my boyfriend at the time (he was a military man, but was one of the good guys – they exist!). I asked that they give me all over highlights. What I got was not at all what I had asked for! I ended up with auburn (read: orange) hair, and was pretty peeved. When I moved to Seoul I was told that hair dressers were more familiar with western hair, so when I went in for a cut and the stylists suggested highlights I was more inclined to go for it. I have no photos, but the colour turned out the opposite of what you see above. I had blonde hair and chunky dark brown roots. After hair fail upon fail I took matters into my own hands. Here are the directions for the salon supply store in Sincheon (by Jamsil in Seoul): take exit 4 of 신천 station. Walk directly out and turn left between the Lotteria and the McDonald’s. Walk about 3 blocks and you’ll see this shop on the left hand side. The actual address is in the photos above (25 Olympic-ro 12-gil). The lady speaks a bit of English and is pretty knowledgeable about colours. She even helped me tone out pineapple yellow with dye since she doesn’t sell toner. The brand is one of the l’Oreal lines (Majirel) so it’s a lot less damaging (and has a lot less copper than typical box dye). If you’re pulling colour from very dark hair, you’ll likely need to use a bleach. My personal recommendation (I’m not a hair stylist) would be to get a highlighting cap. This way you can subtly go from dark to light in a few steps. Since you’re not paying a hair stylist, you can afford the time and effort it’ll take to go from dark to light safely. Don’t be hasty, don’t be cheap, take care of yourself. If you have to do it in a weekend, here’s a how-to guide. My naturally dark brown hair always goes a brassy orange (because red is tough to pull). To offset the orange you’ll need to apply colour with a hint of green (check out the color wheel). I know that’s terrifying, but it works. I usually combine a 10 and a 7 or an 8 when dying my hair. My roots are almost always a different colour than the rest of my hair, but I try to ombré so that it doesn’t look chunky. It’s not perfect, but being blonde in Korea is tough! Vanilla gold? Give it a hard pass. 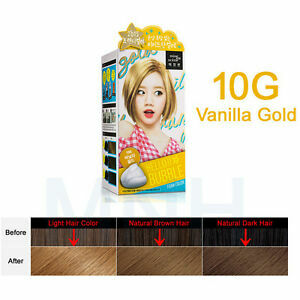 This blonde in Korea box colour, especially in foam form, isn’t going to give you the change you’re looking for. It’s just not strong enough to do a dang thing. I have found a second salon supply store that’s actually closer to my gym and my apartment. Sincheon is on an angle, however, so instructions would be difficult to follow. If you’re looking for a greater selection please feel free to message me on my Facebook fan page (and give it a like while you’re at it!). I’ve never dyed my hair but I’m considering it since I’ve gotten a few grays, but I have not plan to go blonde in Korea! This is pretty interesting though since I am totally clueless when it comes to hair coloring.